Castle Grant is the ancient, ancestral seat of the the Chiefs of the Grant Clan. There was an original fortification called "Ballachastell" meaning "Castle of the Pass" which was located about .25 miles south-east of the present castle, but the present location is on a slight rise called "Freuchie-hillock". Castle Grant was originally called "Freuchie", which means "Heathery Place", and the Chiefs of Grant were styled "of Freuchie" ("Grant of Freuchie") from roughly the late 15th century through the early 17th century. 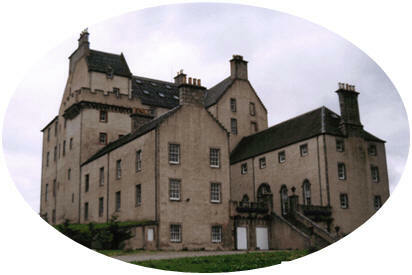 In the late 15th century the lands and Castle became part of the barony of Freuchie. Then, in 1694, by act of William and Mary of England, the lands and baronetcy of Freuchie were erected into the regality "of Grant". From that point the castle was renamed "Castle Grant" and the Chiefs were styled "of Grant" ("Grant of Grant" instead of "Grant of Freuchie"). According to "Castles of Scotland", the original building was a Z-shaped tower house, typical of many that exist in Scotland from the same period, and it dates from probably around the 15th century. The castle has had a number of additions added over the years, with the largest expansion taking place in the 1750's. This latter expansion enclosed the main building, and attached the two outer buildings to the south, creating "wings" on the south side which now enclose the courtyard. The castle has stayed roughly the same since that period. Originally a Comyn stronghold, Clan traditions tell us that the castle was taken from the Comyns by a combined force of the Grants and the MacGregors. According to legend, in the 14th century, a younger son of a Grant of Stratherrick ran off with a daughter of the MacGregor Chief, the MacGregor's being a very powerful clan at this time. They fled to a cave near-by the present castle, today called "Huntly's Cave", where they were set upon and much harrassed by the Chief of Comyn and his people, who were none too happy with these new settlers on their lands. Meanwhile, the MacGregor Chief and his men, catching up with the couple, were received graciously and with much hospitality by Grant and his retinue, and were welcomed into their hideaway. The Grant supposedly gave a feast and arranged the comings and goings of his men such that they appeared as a large force about him, and the MacGregor Chief was so impressed that he forgave the couple and even agreed to help his son-in-law against the Comyns. The very next morning the Grants and MacGregors stormed the castle and in the process slew the Comyn Chief - and kept the Chief's skull as a trophy of this victory. Another variation of this tale is that a Comyn ran off with a Grant woman. Her father and a number of Grant men pursued the couple and one of the Grants slew the Comyn, decapitating him with his large two handed sword. In either event, the skull of the Comyn was taken as a macabre trophy and was kept in Castle Grant and became an heirloom of the Clan. (In the late Lord Strathspey's book on the Clan, he mentions that the top of the cranium was hinged, and that he saw documents kept in it.) Clan tradition predicts grave things if the skull ever leaves the hands of the family - prophecying that the Clan would lose all of its lands in Strathspey. One can only hope it is still safely in the hands of our Clan! The Castle also has its own ghost story. The ghost of Lady Barbara Grant, a daughter of one of the chiefs in the 16th century, is said to haunt the tower of the castle (the tower is still visible from the south and west sides of the castle, but slightly enclosed in its lower sections by architectural additions) called "Barbie's Tower" or "Babbett's Tower". As the story goes, Lady Barbara fell in love with a man whom her father deemed unsuitable for her, a man below her station, and instead he found another man of his own choosing that he considered more suitable for her to wed. Barbara defied her father and refused to marry the man her father had chosen for her. Supposedly the Chief then had Barbara locked in a hidden closet in the tower that was concealed by tapestries and which was called "The Blackness". She was to be kept there until she ceased to defy his wishes. How long she was kept in the closet, no one knows, but legend says she died in it "of a broken heart". Witnesses later claimed to have seen her ghost coming through the door of the closet from behind the tapestry in the tower, stopping at one point and appearing to wash her hands - before disappearing through the door of the tower. When the closet was opened in the 1880's, there was no body found in it. There were only some old swords and muskets hidden inside. Recently when workmen were working late at night in the Castle on the refurbishment of one of the upstairs floors (for the most recent owner), near the tower, they were disturbed by the sounds of footsteps in the tower, the sounds of the door opening and closing, and the sounds of crying and of voices. The workers fled the Castle that night and refused to ever work there again after dark. It may be safe to assume that if the legend is true, then Lady Barbara is still walking the tower which bears her name.